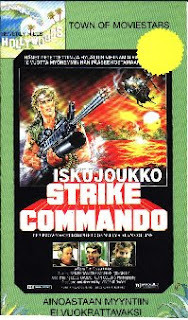 Tough To Kill - EuroAction Movie Depot: Strike Commando - Bruno's Biggest Blast! 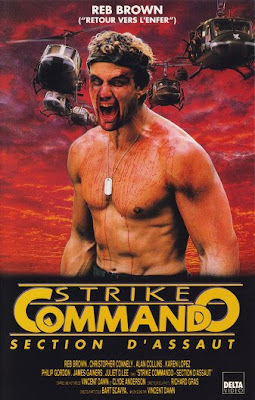 Strike Commando - Bruno's Biggest Blast! A film that defies description without begging for hyperbole, Strike Commando is action-sploitation that pounds outrageous and entertaining mischief in every minute. Really. The brain trust (read: they trust that you will not use your brain!) of Bruno Mattei and Claudio Fragasso fired on all genre conventions, burping out this incredible entry. Michael Ransom (Reb Brown) is one tough Strike Commando-he can’t be killed it would seem. His commando team blows up Vietcong bases with ease, but is double crossed by a skuzzy commander (Christopher Connelly), which leaves him trapped behind enemy lines with little hope of survival. But of course he lives on! Floating down a river and greeted by Vietnamese in whiteface (huh?) who are led by Luciano Pigozzi (dubbed as a Frenchman…huh! )-the hulking American becomes their savior. But the evil Russians, led by the huge and hilarious Jakoda (Alex Vitale) has other plans. Kill ‘em all… and he does. Disneyland gets a mention before that can happen, and holding crushed bodies and yelling, Ransom must make the Russians, the Vietcong, the men in power who treat soldiers like dirt, tiny miniature boats, huts, logic and everything else PAY! And oh, they do. Along the way Ransom is tortured and almost forced to broadcast anti-American radio chatter, but no way, not Ransom. Hell, leaving him with a rotting corpse just stresses him out as his captors find… and when he is stressed, only a zillion bullets and a slow motion waterfall stunt can make him feel better. Well, a little better. People explode and THE END unspools as a wiseass Ransom disclaims any form of truth to the picture. Mattei and Fragasso mashed together one perfectly silly action film, which becomes so zany you can almost feel the fun pouring off the video as you stick it in the player. Not what historians would call solid film making, it doesn’t even try. Reb Brown is delirious in his role, shouting almost EVERY line, be it tender talk of popcorn growing on trees to angered ramblings (“The rest of Strike Commando demands VENGEANCE!”)… This becomes so insane it would be hard to replicate on purpose… if anyone even cared to try. Everyone, be they good actor, non-actor or exploding hut takes the macho to heart. Christopher Connelly exaggerates his reactions like nobody else can while Alex Vitale steals the show with his scenes as the jumbo Russian who hates “Amerikanski” with such vigor that he embraces several fight scenes, lots of cackling and a steel set of chompers that spur the best line of the movie. Mattei directs the action with the flair of a director who has found his calling, you can call him a hack, but you can’t say he didn’t know how to get people to fall down under a hail of bullets. Stuntmen line up to be shot in gloriously wild head flopping style, Brown is in all the right positions to wield a giant machine gun with unlimited ammunition and yes… the waterfall is here for all to see. Backed up by one strange script that Fragasso has concocted, there are endless odd lines of dialogue, mercilessly silly set ups and you have to pay attention as the dubbers obviously had fun... Just listen to what passes as Vietnamese. 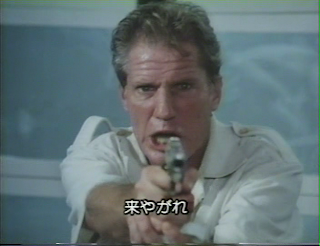 Sharpshooters should look for Rene (Tiger Joe) Abadeza getting conked in the face and composite ninja veteran Mike Monty in the opening sequence! Head Clonking Hyperbole: It’s a grenade in the mouth lovin, raucously ridiculous smash a minute thrill coaster that will leave you with a surplus of spare shell cases littering your memory which only another trip through Reb Brown’s bullet laden Disneyland can satisfy. 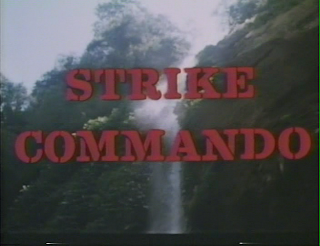 Truly a cult film in every sense, Strike Commando is essential trash. ''Reb Brown’s bullet laden Disneyland'' ... Classic. I wondered what the Stunt Wig went on to do after movies :) . I like what you guys stand for. 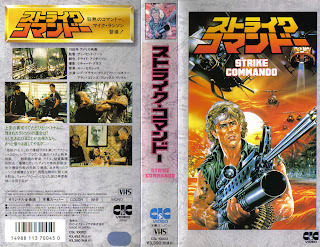 Six months ago, my VCR ate my worn and weathered copy of Strike Commando. On that day, I died inside. Japanese characters make any poster so much more enticing. Paul "BANZAI!" Cooke and David "Tiny Trash" Z welcome you to Euroballistic Madness! Double Target - Mattei Misses his Mark! Strike Commando 2 - Mattei Hut Massacre!